Reconditioned Kirby Ultimate that is loaded with everything you see in the picture and looks almost new. Kirby's are great because they have awesome cleaning power, filtration, and are very durable. Includes the upholstery tool, crack and crevice tool, duster brush, wall tool, floor tool, with two wands. Also includes GV turbo brush mini head, pet tool, inflator tool, handheld tool, handheld shampooer, blower, corner wand, hose and tool caddy. This will also come with the popular Kirby Shampooer system, 1 12oz bottle of Kirby shampoo, the famous Kirby ZIP Brush which is great for cleaning stairs, upholstery, and Car seats, 4 new belts (one installed) 9 new bags we have upgraded the bags to the new 3M style HEPA Bags which are used on the new Kirby model, and 1 bottle of fragrance that you apply to your inner bag to which makes your home smell nice and fresh while you vacuum! One of the best features of this vacuum is it comes with the carpet shampooer (see picture). This comes with the nice HEPA filtration system. If you have allergies or asthma this is a must. Save over $1,000 by buying this item over new retail. It is a pleasure to vacuum with, especially with its self propelled tech drive system that allows you to push it forward and reverse with only 2 lbs. of pressure. This vacuum has had its outer cloth bag cleaned and sanitized. Kirby vacuums outer cloth bag is part of the filtration so this is the only sanitary way to sell Kirbys. We would not buy a used Kirby unless the outer cloth bag has been washed. Kirbys have a very efficient micron filtration system to ensure that all of the dust and dirt stay in the bag and out of your breathing air. The most versatile vacuum made. It can go from upright to canister to hand portable to blower to straight suction upright. This vacuum is designed to last for many years to come. 5 YEAR WARRANTY - GV reconditioning process includes cleaning and sanitizing every part as wells as thorough check and replacing any worn parts to ensure the Kirby is in perfect working order. Warrant covers fan, motors, bearings and transmission. We are in no way associated with the Kirby company. All refurbishment of this vacuum and its warranty has been done through GreatVacs and not the Kirby co. or its associates. Since none of the work refurbishing this vacuum has been done by the Kirby company this vacuum is not considered "Factory Rebuilt" or "Factory Refurbished". To purchase a "New" or "Rebuilt" or "Factory Rebuilt" or "Factory Refurbished" Kirby vacuum, please contact the Kirby Company. Some of the Attachments, Brushrolls, Belts, Tool Caddies, and Bags may be standard vacuum parts and not purchased from the Kirby company. 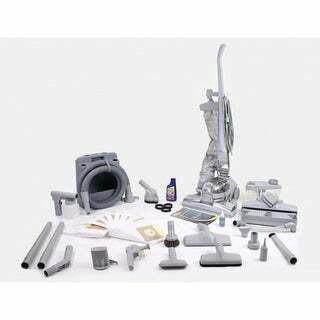 All other parts used to recondition this vacuum by GreatVacs are Genuine Kirby Parts purchased from the Kirby company.